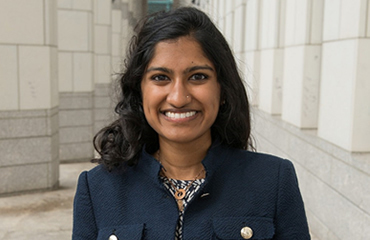 Dr. Kavitha Kolappa is Postdoctoral Fellow in the Chester M. Pierce, MD Division of Global Psychiatry and a psychiatrist at Massachusetts General Hospital. Kavitha Kolappa, MD, MPH is a consultation/liaison psychiatrist at Massachusetts General Hospital and an instructor in psychiatry at Harvard Medical School. Originally from North Carolina, Kavitha was a Robertson Scholar at the University of North Carolina at Chapel Hill, where she received a BA in International Studies. She subsequently received her MD from Johns Hopkins School of Medicine and her MPH from the Harvard School of Public Health. Her academic interests include the brain/body interface, stress physiology, evolutionary neuropsychiatry, and public health. She has worked in various capacities with the Global Health Council, International Rescue Committee, Médecins Sans Frontières, and Universities Allied for Essential Medicines. More recently, she has consulted for the World Health Organization Department of Mental Health & Substance Abuse. Her work has been published in the Bulletin of the WHO, Huffington Post blog, and Lancet Psychiatry.